Maurice Smith overcame “The King of the Streets” Marco Ruas in the main event of UFC 21. Smith, a former UFC heavyweight champion, battled Ruas for five minutes before Ruas had to retire due to a knee injury. Despite the lackluster finish, UFC 21 was a significant show because it saw the debut of the 10-point must system in the scoring. The Iowa fans cheered favorite son Pat Miletich to a successful defense of his UFC lightweight title. Miletich stopped Andre Pederneiras in the second-round by TKO due to excessive cuts. 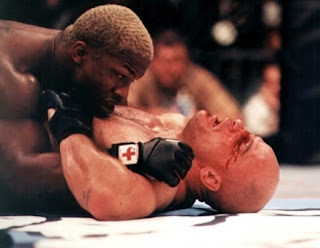 Bas Rutten won the vacant UFC heavyweight title at UFC 20 over Kevin Randleman on May 7, 1999. After a long and successful run in Japan’s Pancrase promotion, Rutten beat Tsuyoshi Kosaka at UFC 18 to earn a spot in the title fight. Randleman earned his spot in the UFC 20 main event with a unanimous decision win over former champion Maurice Smith at UFC 19. Randleman broke Rutten’s nose in the first round, and the fight was stopped twice to check the injury. Rutten battled through the pain.